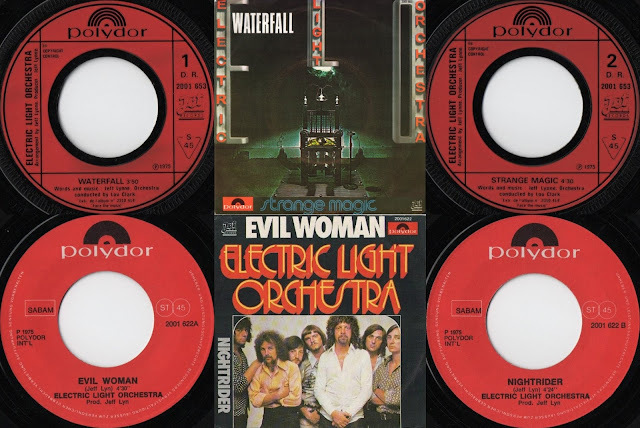 Since then, Yours Truly KJS has acquired a couple of other Electric Light Orchestra singles released in Europe from "Face The Music" that were AA sided by any other name. The first (*as highlighted by FTM Germany's Patrik Guttenbacher) is "Waterfall" backed by "Strange Magic" as issued in France (Jet/Polydor 2001653) and is, to my knowledge, the only time that "Waterfall" has been pressed on 7" vinyl. The other item is a Belgian (*not German) issued "Evil Woman" b/w "Nightrider" (Jet/Polydor 2001622) wherein, unfortunately, Jeff's surname is printed as "Lyn" bringing back memories of the gaffe on The Idle Race's "Impostors Of Life's Magazine" single. Australia - Evil Woman/Fire on High; Strange Magic/Waterfall; Wild West Hero/Jungle; Diary of Horace Wimp/Midnight Blue; and Confusion/Can't Get it out of my Head which was actually marketed as AA promoting both Discovery and Greatest Hits. ... and probably quite a few more!